Algae are uni-cellular organism, very diverse and found almost everywhere on the planet. They play an important role in many ecosystems, including providing the foundation for the aquatic food chains supporting all fisheries in the oceans and inland, as well as producing about 50 percent of all the air we breathe. Algae reproduce very quickly and need only sunlight, water, carbon dioxide and a few inorganic nutrients to grow. Algae can reproduce faster than any other plants, and there are tens of thousands of species of algae, with more constantly being discovered. For commercial purposes less than 50 species are used. Algae consume carbon dioxide (CO2) like any other green plant, when grown, releasing oxygen for us to breathe. 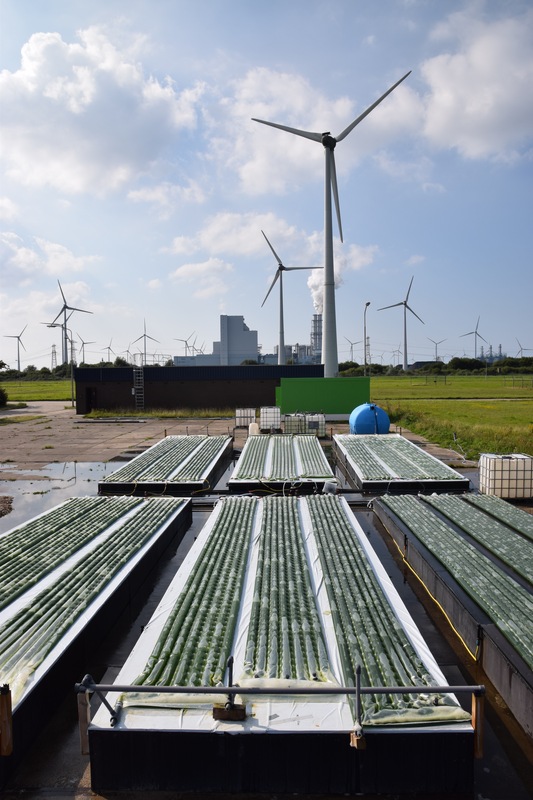 For high productivity, algae require more CO2, which can be supplied by emissions sources such as power plants, industrial facilities or digesters. Algae can grow in a wide variety of climates. 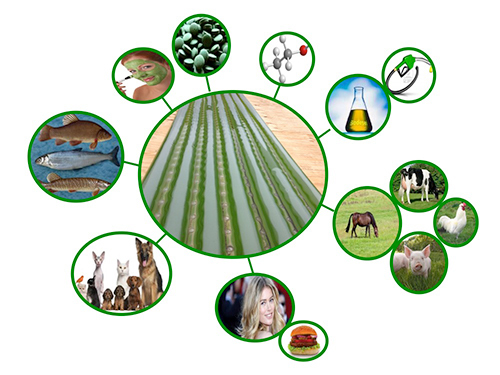 A wide variety of species can be cultured for different products and this new feedstock will create jobs. A wide variety of jobs from research to engineering, from construction to farming, from marketing to financial services will be created. Algae industry can become the base of a world wide circular economy. Food supplements, cosmetics, food ingredients, pet food and aquaculture feed are existing markets. Feedstock for feed, plastics, chemicals, lubricants, fertilizers, and fuels are in development. © Omegagreen - All rights reserved.